A couple times a year, I get to see close friends who live in Boston. They have three funny, smart and talented girls all under the age of nine. Some visits I can be very interactive, playing board games, going to the beach or putting on talent shows. Other times I just can’t. As much as I want to, my head gets the better of me. “You sleep a lot,” says the oldest. Kids are perceptive. They know when I don’t feel well. I explain that I get very painful headaches. I take medicine, but sometimes it doesn’t always help, so I have to lie down. 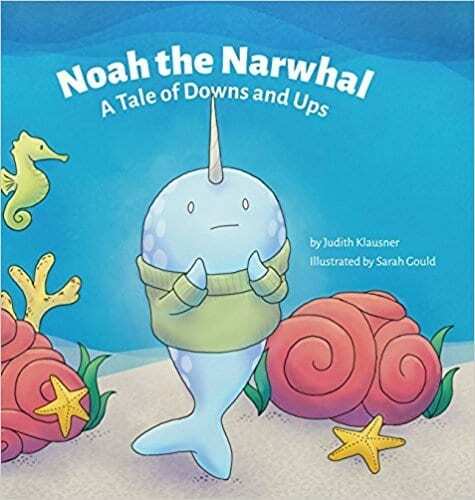 Over the summer I got a chance to preview a children’s book called Noah the Narwhal, A Tale of Downs and Ups by Judith Klausner and illustrated by Sarah Gould. Ms. Klausner has chronic migraine disease, like me. So, I immediately knew I had the perfect audience to test out her book. On my next visit to Boston, I sat down with the girls to read Noah the Narwhal. The story shows how Noah feels great one day, but the next day he has to call in sick to work and cancel plans. He feels guilty about letting others down. When Noah feels better, he finds that others aren’t always sympathetic. The girls caught on to the message Noah uses to explain the downs and ups of his illness – “today is not yesterday.” While Noah may look fine, he has an invisible illness. Just because he was ok yesterday doesn’t mean he will feel well today. Eventually, Noah’s family, friends and co-workers realize that when he has to cancel plans or take time off work, they need to be supportive so that he can take time to rest and get better. When we finished reading Noah the Narwhal, I told the girls that I get sick like Noah and that’s why I have to lie down sometimes. Although I want to play with them, I have to take care of myself. I could see the light bulbs go on once they made the connection. It was really amazing to be able to explain my disease through the story of Noah the Narwhal. I think the best compliment I can give to the author, Judith Klausner, is that the girls asked to read it again! If you have a chronic condition and have kids in your life, I highly suggest buying them Noah the Narwhal, A Tale of Downs and Ups, for the holidays. The book is available on Amazon Prime here or you can support a bookstore owned by Janet Geddis, who also has chronic migraine, here. There are even plush toys and other Noah the Narwhal gifts you can buy here. To see Lisa Benson’s interview with the author, watch the video here.